Our service is 100% results driven, which means you only pay for 4 & 5 star reviews that we are able to secure for your business. There are no other costs associated with using Reviewr. So no start up costs, no sneaky pricing, no integration costs or any costs at all apart from results that we are able to achieve for your business. The payment option that you choose will determine what the cost per review will be. See the options below. 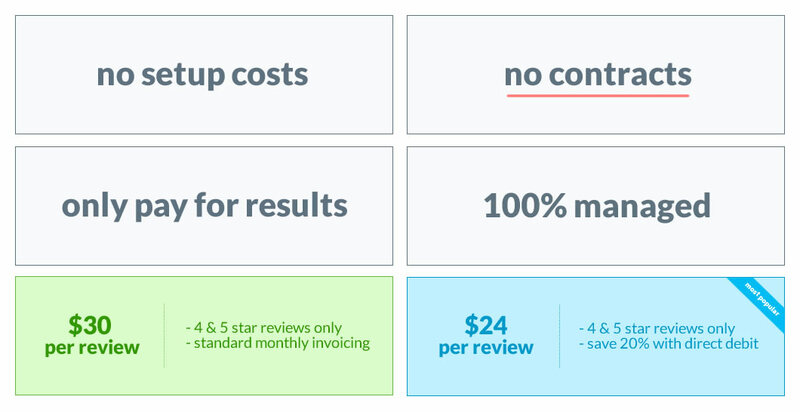 $30 per review – If you choose standard invoicing. $24 per review – If you choose direct debit, you will save 20%. You can choose between either standard monthly invoices or direct debit. Your renewal date will based on your signup date. SO THERE ARE NO CONTRACTS OR FIXED TERMS? None of our clients are tied into any contracts or fixed lengthy terms. Take a look below at how our management work for all clients with Reviewr. There are seven day terms for the standard invoicing option. If you choose direct debit, you will lock in a 20% reduction in costs. There are no contracts or minimum terms that new clients have to sign up to or agree to. A final invoice will be issued if there if there is an outstanding balance to be cleared. View other terms and conditions here.